What Portland Needs to do to become a world-class arts city? The Portland Tribune did a "Re Thinking Portland" special section yesterday on "What do we need to become a world-class arts city?" 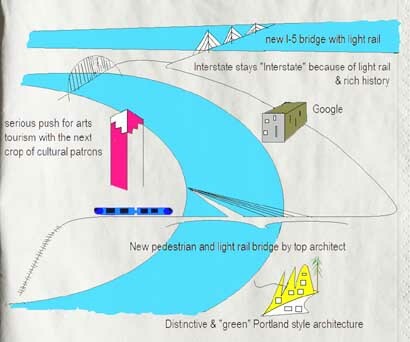 Much of it smart and features a fun and sometimes telling series of napkin sketches of what Portland needs to achieve that world-class arts city status. Though I dislike the term world-class. Also, it isn't news that right now we are institutionally underdeveloped while having a massive influx of serious talent that has continued unabated for at least 10 years. The deluge has even increased and others have noticed. I like it that the author Joseph Gallivan compared Portland to Leipzig. One thing I've noticed is that people now seem to know the money to do serious things exists here but hasn't been fully marshaled yet. I also like how the artists take the burden of educating collectors and donors on as well. A city built by artists (some world-class) rather than a few patrons simply importing culture is a very special thing. Some of the sketches are basic plea's for money (image #5 Elois Damarosh of RACC) while others are philosophical placemats of openess to art ( #7 Brian Ferriso of PAM) or PNCA's Tom Manley mapped out Portland's organizational organ growth (#13). I tried to focus on big time architectural projects like a new pedestrian and light rail bridge by a top architect like Calatrava coupled with arts toursim (#10 because such things change attitudes inside and outside the city) and artists like Sean Healy and my favorite by Jenene Nagy (#11 PORT's hard working behind the scenes business manager) concisely mapped out 3 big needs, more high caliber non commercial spaces, critical sophisticated arts coverage (PORT's mission but we can't do it all) and affordable studio space coupled with hard work. It is also interesting that City Commissioner Sam Adams wants to remain the Arts Commissioner even if/when he runs for Mayor. The BIG question for Adams is, are you prepared to push for the serious things sketched by the arts leaders in this expose or just token creativity and multiculturalism? Just being artsy and artistic isn't the same as getting serious. I remember a time in 2004 when Liz Leach and I double teamed Adams on this issue at her new gallery unveiling. We aren't the only ones, this is the BIG reservation the serious arts community has regarding Adams, running for mayor or not. I get the sense that he is well liked but Portland is ready to step up how about our politicians? 1) An Amenity Bonus Program like Vancouver BC has could allow developers to incorporate cultural tenants and make development an engine of cultural catalyzation rather than a destructive steamroller replacing culture for density. 2) More critical expectations of institutions and the degree to which they fulfill their purpose and how focused and reasonable their aims are. The trick is to do things well, rather than doing too much... i.e. focus. Too often people use "community" as a broad catch all that deflects the real questions about what kind of community, and the quality of what is presented. This has started to happen already, the tide turned 2 years ago and its still coming in (the Oregonian remains the entity most guilty "community" as a form of critical amnesia, even city hall seems to see it as counterproductive). Also, I'll take exception to my friend, Bruce Conkle's quote regarding type A personalities in Portland. A lot of them, including myself , have moved here or returned to Portland and seem to be doing well and getting things done (with an international level reach). I get what he means though I'm not the kind of type A that's willing to push others down in pursuit of my ambitions. Same goes for other Type A's like Liz Leach, Stephanie Snyder, Ruth Ann Brown, Jenene Nagy, Kristan Kennedy, Jesse Hayward, Namita Wiggers and Bruce Guenther etc.... all have shown that they look out for others in the community. Portland has a smart scene, but we should follow our own best advice! Portland attracts a certain kind of generous and conscientious ambition. My honest opinion, regarding your latest article. Shows how out of touch Port is with the art world, let alone the city itself. What Portland needs to do is recognize, galleries that are really making a difference in the art community. I moved to Portland, about 2 years ago and I have witnessed, Ports inability to get it right. Look at small galleries, such as Sugar Gallery which has brought in leading artists from around the world. How do you argue with Elizabeth Weinberg, Ray Lego, Corey Smith, Josh Arseneau, Aaron Jefferson etc. While you are talking about bridges, and napkins, these guys are getting it done. They have continued to give young Portland artists, a fighting chance. While bringing in some of the best contemporary artsts out there. Look at their latest show, Roberto Visani, who is a Fulbright Art Scholar. This guy has shown in the Studio Museum in Harlem, curated by the living legend Thelma Golden. For a gallery that small to show two Fulbright Art Scholars, is in my opinion making it happen. While you play politics, people in Portland are suffering. Portland will never be seen as a real art city, until quasi art curators/critics, get a grip and critique things that are valid in the community and abroad. Artfan, if I may ask, does that mean that you feel creating a better political stance on art is not beneficial to the Portland art world? And I will agree, places like Sugar are bringing in great artists, but for some reason or another, they aren't really getting the job done. And honestly, like many of the spaces in the Everett Lofts, the shows really fail to create a buzz outside Portland. The gallery power in Portland really comes from the blue chips. But still, we need a city system that actually seems like in believes in our little art scene we have here. First off artfan your criticism is misplaced... we did cover some of Sugar's shows Roxanne Jackson and highlifghted Peter Beste at Sugar as well( http://www.portlandart.net/archives/2007/01/february_first.html ). Furthermore no gallery in the Everett Station Lofts is getting it done btter than Tilt and we were the first to point it out. #1 you are completely discounting the fact that another Port Staffer Jenene Nagy also provided a napkin that covered much more than you jst mentioned. #2 I chose to tackle subjects like major architecture and cultural tourism because I knew that other napkin makers were less likely to do so. I also had a major hand in recommending other napkin makers who also touched on your concerns. Read the Tribune piece more closely. So there, instead of being out of touch we are covering a lot more ground and on a lot more levels than simply your pet cause of Sugar Gallery. They have done some good things, but are they more important than the aggregate of reviews for Pierre Huyghe, Brad Cloepfil and lesser knowns like Stephen Slappe and Michelle Ott (at the Albina Press coffee house)? We cover it all as best as we can... and we do so broadly. Competition for reviews is very stiff in Portland these daysand one can have good shows and still not stand out. It really has to "get it done" to warrant our attention. Thanks for caring, Ill probably see you at Sugar tonight? I think my thesis was dead on, in terms of Portland not supporting their own etc. Frankly, I think Sugar has gotten it done outside of Portland. They are the only gallery in Portland, who caters to the younger art crowd. I recently spoke with a girl in NE Portland, who said Sugar is the only place to get Vice Magazine. The relationship, that they have with NYC artists surpasses any small gallery hands down. I know for a fact the owner purchases PDX artists works for his collection, because he bought mine, as well as my friends. So when you speak about blue chips, being the driving force behind the Portland art World, that in my opinion negates all that Port is trying to do. Because lets make it clear Port is no Art Forum Magazine, but it is minimially giving people a chance to voice their opinions in the PDX art world. All I got to say is go to Sugar Gallery's site, and look at what they have brought to our community. How does Port, not right about Ray Lego's polaroids? This guy just shot the Def Tones latest album cover. He is one of the most sought after commerical photographers on the planet! We ignored commercial photography because we arent a commercial photogaph site (focus) and Vice is fine but we arent a hipster site, hence the Richard Serra coverage... Frankly Id buy a graphic novel pitting Serra against the hipsters! As for New York, its a fine place but not the only place that matters... that said lots of Portland galleries are networked there and elsewhere... BFD. solution, you should go to Sugar and enjoy yourself... I cant be bothered with this any more. Your latest response shows the depth of your knowledge of the art world at large. Your non-acknowledgement of the young PDX community is the main reason why young people have lost hope in the Portland art scene. You speak about Richard Serra etc, but the question have you seen the show? When was the last time you were out of your tiny bubble, so you could try to understand the matter at hand. For you to speak about not covering commercial photography, again shows your narrow scope. I am not talking about McDonalds billboards; I am speaking about Ray Lego who recently has been called one of the living legends behind the camera. To be so blatantly small minded, and deducing Port to a fine art blog shows clearly, you need to get out a bit more. Moreover, if my memory serves me right, the New York Times article was on restaurants, not art. Why do you want to create a WE vs. THEM community? Many Portland galleries like Liz Leach, Russo, and Wooley etc. Have working relationships with NYC artists, tell me the number of small galleries? Maybe you ignoring artists, is why Portland is being ignored! For you to say NYC, is not the center of the US art scene, is dead wrong. I recently returned from the show at Sugar, and it was great! I guarantee you, Port wouldn't turn down an interview in Vice, that is for sure. i am also a young artist who moved to portland in the last few years. i think artfan has some good points. this site does pick and choose favorites. that said, artfan is generalizing and unfairly characterizing who and what young portland artists are by more or less stating that the sugar gallery acts thier voice. there are a lot of young artists, fine art as well as commercial who don't fit in or care about the progaming or "scene" of the sugar gallery. i am glad that sugar is around, i will check out the show, but i think artfan is exagerating sugar's importance and impact. First off I was dissapointed with Tilt this month. It is well executed (as allways)but it was underdeveloped work that mines the nature references+wood ply = art fomula. Im over that. Artfan, PORT is less interested in an interview in Vice Magazine than having one in Art in America ;)... it's the most respect-worthy art magazine out there. Also, try settig foot in small a, Motel, Rock's Box or Rererato etc all are hardly geographically challenged and young. Organism's last show featured an artist in the Brooklyn Museum's recent aquisition show and the blue chip galleries like Leachc has a Brooklyn artist this month. Furthermore, Miami during the art fairs is the closest thing to a center for the national art scene... otherwise its pretty spread out, things are more international than they were 15 years ago. For example a lot of San Francisco galleries focus on London as their #2 market destination after Miami. New York is no longer essential to having an serious career (sure it helps but it isnt essential). So, that's just the way it is artfan and thanks anotherartfan for adding a little more to the discussion. I think anotherartfan, made a valid point for sure. But the question is what do young artists in Portland care about? When you have galleries like Rake, that are forced to show their members work, its hard to open up the playing field. Also I really don't know another gallery outside of sugar, that tries to bring in a young fresh contemporary edge (Pop Photography included). The question for you Double J, is did you check the show out at Sugar? Or do you just slam things in cyber world, because thats your way of feeling better about yourself. I think you are being over dramatic, to say you would turn down an interview in Art in America, whatever! If your intention is to bring the art world to Portland, thats the best way to do it. For you to negate NYC art scene, and compare it to such a young city like San Francisco shows, Port needs some new voices. When was the last time you were in Chelsea NY? Or the lower east side of NYC, to see whats happening there. And you talk about coverage in the New York Times, if NYC was of such little importance, why would you mention the article? And your tone is so dismissive, and mitigating, who are you tell someone the "thats the way it is"? Maybe if Port would invest, in a columnist, who was interested in building relationships, you wouldn't have to draw on napkins, to figure out how to improve the Portland art scene. People would be more interested in helping the whole community at large. Because honestly, if one gallery thrives, shouldn't they all? Its about community, not treating Port like your childhood tree house. Look Im hardly being dramatic. Please pay attention, I wrote that PORT was more interested in being interviewed for Art in America than Vice. They each have their place. Just chill out on posting for a while... I appreciate your crusade but youve made your point. PORT isnt a forum for personal rants. A little is fine but this is enough.